A research team of the Department of Physics, Keio University, has discovered a giant molecular cloud located in the Galactic center, approximately 30,000 light years away from our solar system with a peculiar helical structure by observation with the NRO 45m Telescope at Nobeyama Radio Observatory, National Astronomical Observatory of Japan (NAOJ). The team named it a "pigtail" molecular cloud because ofits shape. Giant molecular clouds in this region orbit around the Galactic center along two closed orbits. At the bottom of the pigtail molecular cloud, these two orbits intersect. The research team analyzed multiple molecular spectral lines in detail. The researchers have revealed that the two giant molecular clouds collide with one another at exactly the bottom of the "pigtail" molecular cloud. These findings suggest that the helical structure of the "pigtail" molecular cloud formed when the two molecular clouds with different orbits frictionally collided and the magnetic tube was twisted. It is generally thought that helical structure of gas is associated with twisted and coiled magnetic lines. The structure is occasionally observed in astronomical phenomena with magnetic force, such as the solar coronae or the jets related to the super-massive black hole in galactic center. The solar corona is the plasma gas covering the outermost atmosphere of the Sun, and it has an extremely high temperature of approximately one million-degrees Kelvin. Within a 600-light-year radius from the center of the Galaxy where we live, there is a high density of stars and molecular gas that forms stars. The molecular gas becomes a dense "molecular cloud," and it is thought to move mainly along two elliptical orbits around the Galactic nucleus. These two elliptical orbit groups have a nested structure, and intersect at two points on the Galactic disc. At the intersections, both molecular clouds frequently collide. Researches so far suggest that those collisions between molecular clouds cause gas to be compressed, triggering active star formation. In addition, from previous radio observations, the existence of some radio sources extending perpendicularly from the Galactic disc has been confirmed. That means there is the flux of magnetic lines of approximately one milligauss perpendicular to the Galactic disc. 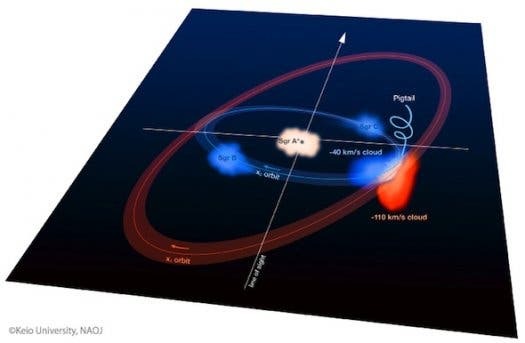 However, the issue of whether the perpendicular magnetic fields exist throughout the Galactic center region (an approximately 600-light-year radius) or only locally has long been controversial. A member of the research team noticed the existence of a helical molecular cloud when he carefully examined the mass data of 115-GHz rotational spectral lines emitted by carbon monoxide (CO) molecules. The 45m Telescope at Nobeyama Radio Observatory (NRO), NAOJ, acquired the data. The helical structure is approximately 60 light years by 60 light years. Wondering what this was, team members immediately searched a similar structure in the data taken by ASTE (Atacama Submillimeter Telescope Experiment) covering the same region. Sure enough, they also found the same helical structure in the data of 346-GHz spectral lines emitted by CO molecules. However, the helical structure in that data was not clear. In order to solve the mystery of the pigtail molecular cloud, the team carried out high-resolution spectroscopic observations of rotational spectral lines for six other molecules. Those molecules are clues to understanding the physical state. They were amazed by the clear and beautiful helical structure of the "pigtail" molecular cloud in the data taken by the follow-up observation. The data revealed that the pigtail molecular cloud has a huge volume of gas, several hundreds of thousands times greater than the Sun has. On the other hand, from the analysis of several molecular spectral lines, they learned that the "pigtail" molecular cloud has relatively higher temperature and density [Tk~30 K、n(H2)~103.5 cm–3]. In addition, an increase in the abundance of silicon monoxide, SiO, a molecule which originates from a shock wave, was found. This means that an intense collision occurred in this area. At the bottom of the "pigtail" molecular cloud, two different molecular clouds intersect; one has a radial velocity of -40 kilometers per second, and another one is -110 kilometers per second. At the exact location of the "pigtail" molecular cloud and the intersection, gas functioning as a bridge between the two molecular clouds was detected. Collecting these observational results the team concluded that the collision of the two giant molecular clouds was deeply involved in the formation of the pigtail molecule cloud. The research team has proposed the following scenario on how the pigtail molecular cloud was formed: 1) The magnetic tube perpendicular to the Galactic disc exists between two giant molecular clouds. Those clouds move along the main two elliptical orbits around the Galactic nucleus. 2) The magnetic tube is twisted and squeezed to become a helical structure during the frictional contact. 3) The molecular gas is captured by the twisted magnetic tube, and then forms the "pigtail" molecular cloud. The research team estimates that a perpendicular magnetic field of approximately one milligauss can be found locally. The "pigtail" molecular cloud formation is generated by the magnetic field. Theoretically speaking, it is expected that the creation of this type of helical structure would be difficult when magnetic fields extend over the all Galactic central region. In addition, it is estimated that approximately 1.8 million years is necessary for the growth of the "pigtail" molecular cloud. That period is equal to that of the two molecular clouds colliding with each other. 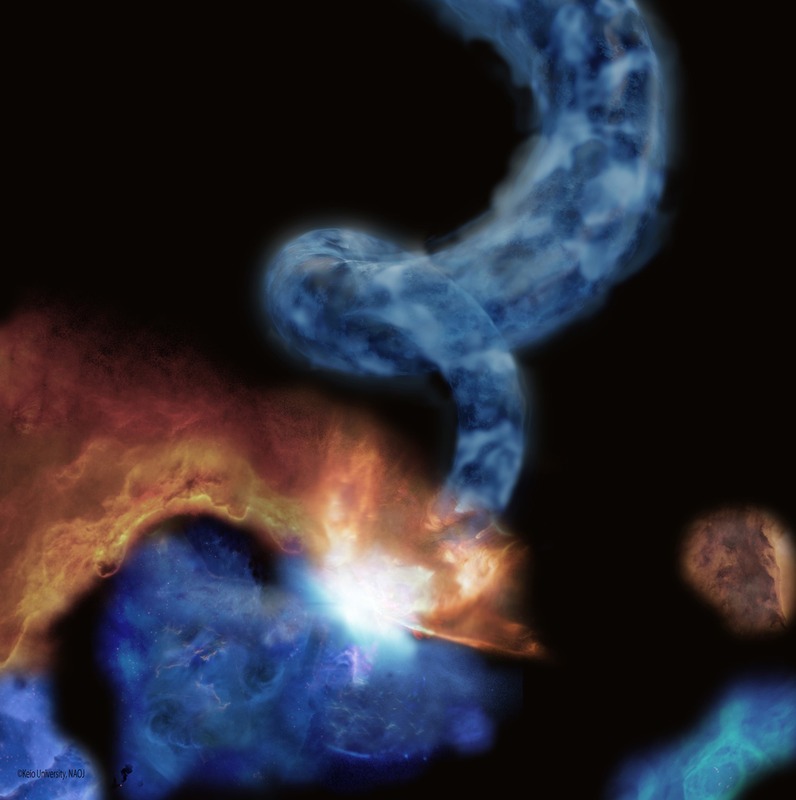 So far, two other helical structures have been found around the Galactic center. The "pigtail" molecule cloud, however, has a much clearer helical structure than the others. The "pigtail" molecular cloud is an important clue in probing molecular cloud dynamics in the Galactic disc, as well as the structure of magnetic fields, due to its close location to the Galactic disc. Structures related to magnetic field can be found in any kind of astronomical phenomena, ranging from the solar surface to jets related to activity in galactic nucleus. Research on cosmic magnetic fields has significance for understanding the formation of a variety of phenomena in the Universe. The results of this research have provided important findings on the role cosmic magnetic fields play in the Galactic center. The image below shows two giant molecular clouds with different radial velocities. The solid green line shows the pigtail molecular cloud.